The Super Smash Bros. Ultimate Special Edition steelbook bundle is back up for preorder on Amazon and Walmart right now for $140, and will inevitably sell out again in short order. 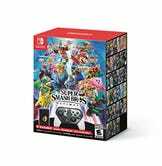 It includes the game, a steel case, and a Smash-themed Pro controller. The controller will also be sold separately, though quantities will likely be limited. Or, just get the game for $60, plus a $10 Amazon credit for Prime members (delivered 30-35 days after the game ships).